Solid Sterling Silver Ladies Spiral Celtic Wedding Ring. Excellent Quality. Made in Dublin, Ireland. This is an authentic Celtic Wedding Ring made by master artisans. I wanted a small wedding band to wear in the summer when my hands swell due to the heat and humidity. 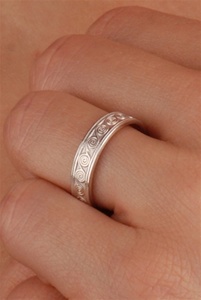 The retired ladies celtic wedding ring LS-WED113This ring is perfect! They had my size (9) and I received it sooner than I expected. I had hoped it would be a little wider but with my short, fat fingers, a wider one would have been too much for my finger/hand.